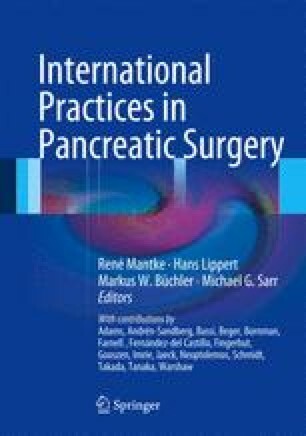 Cystic lesions of the pancreas are frequent findings with an age-dependent incidence of up to 25 % in elderly people as estimated from autopsy findings and from current techniques of imaging (Kimura et al. 1995; Jani et al. 2011). This spectrum of both benign, neoplastic and malignant or potentially malignant lesions must be differentiated from pancreatic pseudocysts as a residual finding after acute or recurrent chronic pancreatitis. Three important cystic neoplasms have to be recognized and differentiated from one another – serous cystic neoplasms (SCN), mucinous cystic neoplasms (MCN), and intraductal papillary mucinous neoplasms (IPMN). The relevant clinical importance of these cystic lesions of the pancreas is the malignant potential arising from MCN and IPMN, and thus, the need to recognize, differentiate, and manage these neoplasms correctly.